Can WWII tale of love on U.S. base in USSR inspire better understanding? Russian émigré writer Eduard Topol hopes that his new novel based on the real-life story of Operation Frantic, a series of bombing raids on Nazi troops carried out by U.S. planes from bases in Soviet Ukraine in World War Two, could help to improve relations between Moscow and Washington. While many in Russia cherish hopes that Russia and the United States might fight common enemies together under President-elect Donald Trump, Russian writer Eduard Topol finds similar examples in history. The writer, who has spent almost 30 years in the United States, has recently penned a novel called Flying Jazz, dedicated to the U.S.-Soviet military alliance during World War Two. The novel’s action, which revolves around the love story between an American pilot and his Ukrainian girlfriend Maria, takes place on the U.S. military base in Poltava, then part of Soviet Ukraine. The base was not a fiction, but a real project established by the U.S. military command in the Soviet Union with the blessing of Joseph Stalin in 1944. The operation, which became known as Frantic, saw U.S. Air Force planes carry out shuttle bombing missions on German positions from Soviet airfields located in Soviet Ukraine. The airfields, which hosted around few dozens of B-17 Flying Fortresses, were used by American pilots to bomb Nazi oil-refining facilities in Romania and Hungary. “Not many people are aware that those bases ever existed, but I was always fascinated by that story,” Topol told RBTH during an interview in Moscow. After making a career as a scriptwriter in the Soviet Union, Topol was forced to immigrate to the United States in 1978. 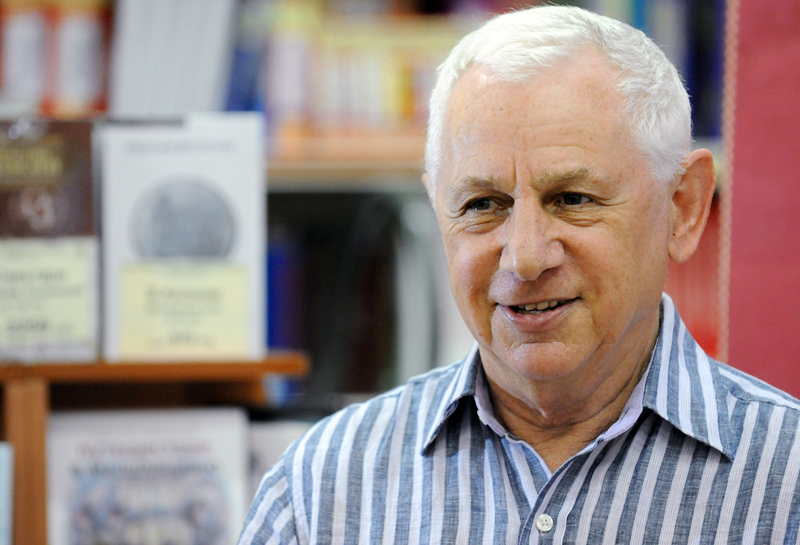 He has written dozens of books, including the 1983 international bestseller Red Square. Topol, who said that the novel is dear to him because it brings back nostalgic memories about Poltava, where he spent part of his youth, explained that he carried out extensive research while working on Flying Jazz, reading many books about Operation Frantic in both Russian and English. He has also used the account of a real witness, the Soviet war cinematographer Semyon Shkolnikov, who shot reels of film about the allied operation, including aboard one of the U.S. bombers: “It is a well-documented love-story,” said Topol. Through the love story in Topol’s novel is pure fiction, both Soviets and Americans established a good relationship on a human level during the operation. Many Americans, such as military historian and former United States Air Force major Mark Conversino, expressed this sentiment. In his book Fighting with the Soviets, he wrote about the friendship between U.S. and Soviet soldiers. Topol hopes to option the book for a joint Russian-U.S. film production, possibly staring American actor Steven Seagal, who was recently awarded Russian citizenship by President Vladimir Putin. A chance for Russia and the U.S. to start over again? A U.S. citizen and staunch supporter of President-elect Donald Trump, Topol hopes that his new book might help the U.S. and Russia to mend fences again. Drawing parallels with the WWII alliance between the Soviet Union, the United States and Britain, Topol believes that the U.S., Russia, Europe and Israel should join forces to fight the Islamist terrorists in Syria. “I have been writing about it for almost 20 years. International terrorism is the enemy for the Western Jewish-Christian civilization,” he said. While there are many people who share Topol’s view, Washington and Moscow have failed to reach an agreement during the Barack Obama administration despite the efforts of both Foreign Minister Sergei Lavrov and his U.S. counterpart John Kerry. However, Topol believes there is a chance that Trump may be able to forge a strong working relationship with Vladimir Putin that would be capable of achieving results in the fight against terrorism, as well as reducing tensions between Russia and the U.S.
“When both leaders had a conversation over the phone, they both agreed that international terrorism is the number one enemy. The fact that my book was published two weeks before the Trump-Putin conversation was just a coincidence, but a good one,” he said. Vladislav Shurigin, a political journalist who also covers military issues, believes this is possible: “It will for sure change the course of history if we will fight a common enemy together. But for now, we are only trailing the Americans, who are fighting their own enemies,” he said.